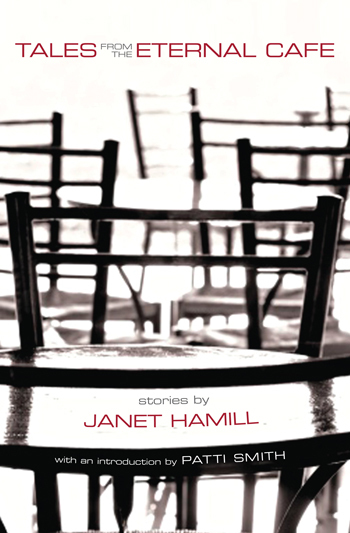 “Acclaimed poet Hamill (Body of Water) uses the location of a cafe, a destination long associated with thinkers, dreamers, and conversationalists who dwell there, as the springboard for many of the stories in this rich and diverse debut story collection. Each of the 17 entries dazzles with virtuosity and uniqueness . 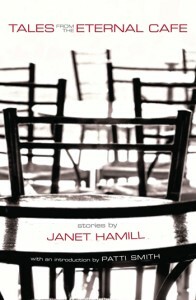 . . Hamill’s dialogue tactfully embraces each setting and her keen eye for the detail is enthralling. Readers will be thoroughly drawn into scenes of love, redemption, belief and delusion as well as alienation and fear in this terrific collection.” Publishers Weekly Complete review here. “Some of these are stories are so exquisite they could almost be considered prose poems…Rich and rewarding. A fascinating collection.” —Wally Wood, BookPleasures.com. Read the complete review here. JANET HAMILL is the author of five books of poetry, prose poetry and short fiction. 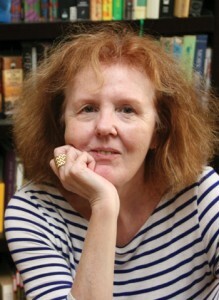 Her work had been nominated for the Pushcart Prize and the Poetry Society of America’s William Carlos Williams Prize. Tales from the Eternal Café is her first complete collection of stories. In addition to her books, Janet has released two spoken word CD’s with the band Lost Ceilings (previously Moving Star), featuring cameos by Lenny Kaye, Patti Smith, David Amram and Bob Holman. After three decades in New York City, Janet now resides in the Hudson Valley.